PULZAR HEAVY GREASE is a calcium base grease offering excellent water resistance. The selective base oils give an excellence film protection from rust and corrosion to keep the excellent lubrication to the metal surface. 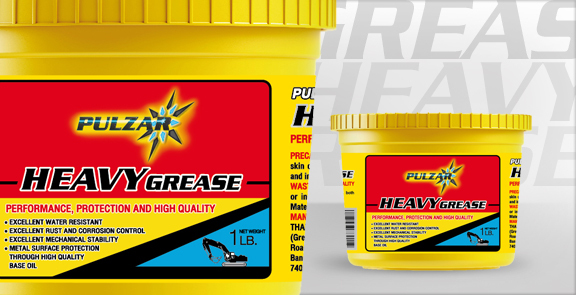 PULZAR HEAVY GREASE is recommended for used in moderate duty plain and anti-friction bearings wherever non-extreme pressure grease is recommended. PULZAR HEAVY GREASE is also used as a process material for variety products. PULZAR HEAVY GREASE can be applied by either centralized pressure grease systems or by grease guns. It is suitable for use in heavy-duty equipments.